The rise of social media and the broad diffusion of ‘smart devices’ in contemporary society have profound implications for crisis management. The emergence of social media and smart devices pose both major challenges and major opportunities to crisis managers (c.f. Palen, 2008; Veil et 2011). These social practices and technologies change rapidly which can create difficulties for organizations seeking to incorporate them into their preparedness and crisis management efforts. This article unpacks crisis management into a number of key tasks (Boin et al, 2005) and identifies a number of aspects of social media enabled by personal communications technology of particular relevance to these tasks. The article concludes with a set of practically-oriented observations relevant to the ongoing effort to bring social media and smart devices into crisis preparedness. The rise of social media and the dramatic proliferation of ‘smartphones’, tablets, smartwatches and other forms of wearable devices in recent years have profound implications for the management of public and private life, not only under normal conditions, but also in times of crisis. The potent combination of social media and smart devices pose both challenges and tremendous opportunities for crisis managers.1 These social practices and technologies evolve rapidly and are thus a moving target for organizations seeking to incorporate them into their preparedness and crisis management efforts. This article unpacks crisis management into a set of key tasks2 and identifies aspects of social media of particular relevance to these tasks. In addition, a number of observations relevant to the complex, challenging and multidimensional task of bringing social media into crisis preparedness are made. Why do social media and the rise of the smartphone present such serious challenges—and dramatic opportunities—to crisis communicators and crisis managers writ large? Social media have been developing, diversifying, and expanding their reach in a highly dynamic and multi-directional fashion. Media organizations traditionally operated in a one-way mode in which media gatekeepers selectively gathered and distributed information to the public. Contemporary social and hybrid communications media now facilitate and incorporate a variety of multidirectional, decentralized conversations among citizens themselves as well as among citizens, journalists, and elites. In this sense social media are highly participatory. Though it has been suggested by Malcolm Gladwell3 among others that social media are primarily about relatively weak social ties among large numbers of acquaintances, in fact social media support both weak and strong (close friends, family, and colleagues) ties. In crisis situations, therefore, people are potentially communicating with and taking real time behavioral cues from the words and deeds of those closest to them, from others in their physical and online communities, as well as from various public and authority figures.4 Social media are constantly developing and changing, reaching broader and broader demographics and developing new, dramatic, and potentially disruptive capabilities. Familiar platforms evolve and branch out while new ones regularly appear on the scene. Facebook not only expands its repertoire for expressive emotions and opinions about posts, but also develops specialized capabilities for enabling people to report their status and inquire about others in disasters. The familiar ability of YouTube to serve as a partially curated platform for uploading and publishing videos is complemented by the ‘revolutionary’ ability of more recent social video media (e.g. Periscope and the new Facebook Live functionality) to stream personal video live and in real time. Social media and other related web-based and smart device-enabled services such as Craigslist, Angie’s list, Uber and TaskRabbit serve to radically reduce transaction costs and help buyers to find sellers or service providers and compare prices with greatly enhanced speed, efficiency, and accountability. What we are seeing is an enormous expansion, acceleration, and diversification with regard to the production and consumption of information. These developments have profound implications for public policy and politics in general—and for risk and crisis management in particular. The debate regarding controversial issues rages in new, highly visible and accessible fora. The competitive nature of the market for advice as well as processes of opinion-making and taking has sharpened considerably. A wider variety of views are made available more easily to broader and broader segments of the population on a 24/7 basis. This socio-technical infrastructure of communication— that brings the world to one’s hand as well as one’s computer —facilitates not only rapid mobilization of opinion coalitions with regard to policy issues but also the potential for equally rapid counter-mobilizations. Furthermore, and this realization is as yet unevenly distributed in both government and the corporate world, social media and the smartphone revolution provide new means of documenting and spreading the word about alleged injustices, insensitivities, or incompetence. In other words, much as traditional mass media have provided alternative means of holding government and industry accountable, so too do social media and smartphones provide new and powerful means in this regard.5 To take just one obvious example, the ubiquity of camera phones with both still and video capability – along with the proliferation of body and dashboard cameras is changing the conditions of policing – for better and worse. The power of images, and especially video, portraying apparent examples of unjustified use of(often deadly)force is unmistakable as indicated in the many cases which have gone viral—from Ferguson, Missouri to New York City, from South Carolina to Israel. The deployment of these capabilities can both trigger crises (of legitimacy) for government and first responders and as we will see— also provide new and equally powerful means of managing them. What are the core tasks of contemporary crisis management6 and what are the implications of the rise of social media and smart devices for these tasks? What are the key aspects of social media which should be taken into account when developing strategies and systems for crisis management (including crisis communication)? Several decades of intensive empirical research10 and practical experience of crisis management in contemporary governmental/nongovernmental settings shows that organizations and their leaders face recurring challenges when confronted with (the prospect of) community, societal, or international crises.11 These challenges are sense-making, decision-making & coordination, meaning-making, accounting, and learning. Sensemaking12 in crisis refers to the challenging task of developing an adequate interpretation of what are often complex, dynamic, and ambiguous situations.13 This entails developing not only a picture of what is happening but also an understanding of the implications of the situation from one’s own vantage point and that of other salient stakeholders. As Alberts and Hayes14 put it: “Sensemaking is much more than sharing information and identifying patterns. It goes beyond what is happening and what may happen to what can be done about it.” Prior to a crisis, sensemaking is difficult due to attention scarcity, weak or conflicting signals regarding mounting threats, and a high degree of uncertainty. Once it is clear that a crisis has occurred, a paradoxical combination of information overload and uncertainty/scarcity regarding key parameters is common. Given the changes in the media and communications technology landscape noted above, it is clear that sensemaking efforts—not only by government and non-governmental agencies involved in crisis/emergency response but also by ordinary citizens seeking to protect themselves— can be enhanced via crowdsourcing and communication facilitated by social media and personal communications technology (such as smart devices and computers). These socio-technical platforms enable multidirectional exchange of information and provide windows into the perceptions, pre-dispositions, and concerns (short term and longer term) of citizens and other members of the community.15 As such, social media-based information serves as a complement to other sources of information/intelligence. Furthermore, empowered by personal communications devices and networks, individuals are now able to document and share (potentially time-stamped and geo-tagged) text, images, and video also complementing more traditional situational reporting. Meaning-making and Crisis Communication20 refers to the fact that crisis managers —across sectors—must provide relevant information in a timely fashion, attending not only to the operational challenges associated with a contingency, but also to the ways in which various stakeholders and constituencies perceive and understand it. Because of the emotional charge associated with disruptive events, followers look to leaders—and to each other— to help them to understand the meaning of what has happened and place it a broader perspective. By their words and deeds, leaders and other communicators can convey images of competence, control, stability, sincerity, decisiveness, hope and vision—or their opposites. Social media channels—including direct social media based communications by leaders on fora such as Twitter—have become a key arena in which information is exchanged and where alternative political visions as well as risk and situational assessments compete.21 A sound understanding of the discursive backdrop and the frames of reference of citizens and opinion leaders is essential to formulating and implementing effective strategies for crisis communication. Credibility is a key asset; guard it! Communicators who start out with or quickly develop credibility deficits face a significant additional obstacle with regard to crisis communication. By contrast, communicators who are proactive about getting and sharing the most salient information, who promptly correct erroneous information and are circumspect about making and fulfilling promises will tend to maintain and even gain credibility over time. Credibility takes time to establish and rebuild, but can be destroyed in a single careless moment. Crisis Management is hard; manage expectations. Crises are, by definition, difficult to manage. Distinctive features include value complexity and conflict, time pressure, and profound uncertainties regarding hazards and threats, efficacy or consequences of possible solutions, and reactions by adversaries, allies, other key stakeholders, and the public. Though it is often tempting to project optimism and impressions of control, recognizing the severity of the challenges to be faced and overcome is generally a more prudent—and sustainable—posture. Acknowledging the seriousness of the situation and sketching out the steps being taken to prepare and respond tends to inspire—and is more likely to maintain—public confidence than a rosy scenario overtaken by events. Furthermore, lower citizen and media expectations are easier to fulfill. Crises provoke strong emotions and stress (for leaders and citizens alike). Crises are often associated not only with high levels of negative (e.g. fear, anger, outrage, shame, uncertainty) but also potentially with positive (courage, cooperation, pride, solidarity, focus) emotional states and expressions. Crisis communicators must seek to understand and adapt communication to the emotional states of those with whom they need to communicate. Conveying crucial information is important and difficult—but not enough. The first—and difficult enough—hurdle of crisis management is to make sure that everyone—inside and outside of government—has the information they need to play effectively their roles in the crisis management effort and/or to protect themselves and their loved ones. This sounds simple, but is in practice a vital and yet often very difficult task, especially when information and communications infrastructure is degraded through physical damage or overloaded by crisis-related usage surges. Challenging as it is, conveying crucial information is a necessary, but generally not sufficient, component of crisis communication. Crises produce a demand for symbolic and emotional (as well as substantive) leadership. Those experiencing negative emotions such as the ones mentioned in the previous point tend to look to their leaders (and others who communicate on their behalf) for hope, inspiration, empathy,23 and guidance. Citizens and employees expect leaders to inform themselves and recognize the importance of what has occurred, reach out to those who have suffered losses, affirm core community values, restore hope and point the way forward. Why was it not possible to prevent the crisis from occurring or more effectively mitigate the damage? Why was the organization/society not better prepared? Why did delays, misunderstandings, miscoordination, miscommunication etc. occur? Why was the response not more effective, fair, legitimate etc.? Who is to blame for these alleged performance or fairness deficits? The rise of social media and personal communications technology— as well as other forms of public/personal surveillance technology such as closed circuit television, police vehicle, body or helmet cameras etc. — has profound implications for the accountability process. The media, public sector accountability fora, and other actors in public discourse are now provided with real time information, competing accounts regarding incidents, and feedback (though not necessarily sound, systematic, or reliable) regarding citizen reactions and satisfaction with services provided by crisis actors. In other words, the scope, complexity, granularity, and accessibility of accountability-relevant information has increased dramatically. Effective learning25 requires an active, critical process which recreates, analyzes, and evaluates key processes, tactics, techniques, and procedures in order to enhance performance, safety, capability etc. The learning process has just begun when a so-called lessons- learned document has been produced. In order to bring the learning process to fruition, leaders must initiate effective change management / implementation in a fashion that leaves the organization with improved prospects for future success.26 See the discussion of social media as learning tool below for a more detailed discussion of the implications of social media for learning from crisis. These observations demonstrate that in principle, the rise of social media and smart devices are highly relevant to core crisis management tasks. However, from a policy-technology diffusion perspective, there is reason to assume that governments and other organizations in different countries and socio-technical contexts will be disposed and positioned to reap these potential benefits at different rates and to somewhat differing extents. Let us now delve a bit more deeply into some of the ways in which social media are relevant to crisis management in the era of smart devices. Channel: The simplest—though still a very important— way of understanding social media is as an additional channel for getting the word out to significant constituencies.28 Thus, social media becomes yet another way of pushing information out to those a government agency, non-profit organization, or corporation wants to reach. For example, during the recent Ebola outbreak, interest in the U.S. CDC emergency twitter feed reportedly rose dramatically, breaking the magic million mark in terms of followers (as of December 2016, the feed has 1.76 million followers). Note that the channel metaphor focuses on more traditional one way communication—such as from an agency to the public. It is not surprising that early efforts to harness the power of social media for crisis communication purposes tended to emphasize this relatively familiar aspect. Arena: Social media also serve as arenas for competitive communication of various kinds. Public, private, and non-profit actors alike compete for attention in social media, position themselves with regard to key constituencies, and debate controversial issues of public and foreign policy. This metaphor serves as a reminder that communication does not take place in a vacuum, but rather against a backdrop of past, simultaneous, and anticipated future communications by rivals. Communication strategies that might have been effective for an ‘unopposed’ organization may prove highly vulnerable to one whose every utterance is being critically examined by rival organizations. How is the organization being perceived? Is the message attracting attention? Is the message reaching intended target groups? Is it having the intended effect? Who are the key competitors for influence on this issue? What competing advice or counter-arguments are surfacing? What, if any, misconceptions are in need of correction? This is potentially a very powerful use of social media that can enable quick remedial action or revision of message in the face of indications that messaging has not produced the intended effects. This may be particularly useful in fast-moving crisis situations in which margins of error may be small, traditional means inappropriate or inapplicable, and rapid feedback particularly useful. Radar: Monitoring social media feeds can provide invaluable information and “intelligence” (broadly defined) for warning, prevention, response, and recovery. In crisis situations in which information is scarce at the outset, social media provide opportunities for both data-mining and crowdsourcing of information (see above) —strategies which can facilitate early detection of potential threats as well as improved situational awareness for crisis managers and citizens at every stage of the crisis process.36 Citizens can serve as eyes and ears for each other and for organized crisis responders. Just as traditional media have come to rely on so called i-reporters, government can leverage official situational reporting with citizen reporting that can be aggregated, analyzed, and displayed in ways supportive of the crisis management effort. Such tools were used—with mixed effect— in the hunt for the Boston Marathon bombers, where both traditional and social media were used to protect and guide citizens as well as encourage them to report observations to the authorities that could be helpful in identifying and finding the perpetrators.37 Social media feeds can also be mined—manually or using various forms of automated social media monitoring and analysis tools—to provide information about potential human threats and natural hazards, citizen preparedness, and other phenomena relevant to crisis management. Each of these metaphors captures distinctly different “faces” of social media—each with its own distinctive sets of possibilities and challenges. As organizations seek to develop and adapt their crisis preparedness postures to changing conditions, each of these aspects is worthy of serious consideration. The developments and trends regarding information and communications technology noted above are highly salient to the domains of public safety, security, and resilience. Despite significant progress in recent years, understanding and analyzing the implications of these rapidly evolving phenomena remains an urgent task. The results of analysis and conceptual work presented above may be summarized in the form of six key takeaways. The Social media/smart device combination is a double-edged sword. There can be no doubt that social media is a potentially powerful force multiplier and has rapidly become an essential tool in the contemporary crisis and emergency management tool box. However, it is important to be aware that social media and the capabilities of smart devices can work for—or against—any given organization at any given time. These capabilities can be used not only by ‘pro-social’ actors but also in various ways by foreign state adversaries, terrorists, organized and cyber-criminals, as well as others who do not have society’s best interests at heart. Organizations need to be prepared to use social media proactively and offensively—to seek to gain and maintain the initiative—in crisis situations. They also need to be prepared to cope with social media-based propaganda and disinformation. In today’s communications environment, crisis managers must be resilient and alert enough to ride out viral waves— and seek to turn the tide— of outrage and negative social media reactions. Mind the digital divide and embed social media strategies in a comprehensive approach to strategic and crisis communication. Though social media and smart device use continues to grow and spread across demographics in society, it is important to keep in mind that that there are and are likely to continue to be significant elements of the population who choose to refrain from— or lack the means and/or know how—to make use of social media and the smart device revolution. This has a number of aspects. First of all, crisis communications strategies should make use of a variety of modalities and differentiated approaches to reach the full range of target groups in society. Analog (e.g. warning sirens and loudspeakers) and digital means, conventional and social media may all have their place in crisis communication strategies. Furthermore, crisis communication is facilitated by having effective risk communication and issues management programs well before (and after) periods of acute crisis.41 Cultivating credibility and educating the public and the media in advance about threats, hazards, and response protocols, set the stage for effective crisis communication and a fruitful conversation under crisis conditions. Exploit synergies among and develop partnerships with both social and traditional forms of media platforms and organizations: Clearly, as observed above, traditional media and social media are growing together and becoming intertwined as part of a broader trend towards media convergence. Developing strategies for risk and crisis communication which engage the full spectrum of and connections among media in contemporary communication landscapes is essential. For example, advertising and publicizing crisis apps, web, or social media pages via print and broadcast as well as online will help to reach the greatest number in the shortest time, when it matters most. For example, when Washington D.C. was hit by the Snowmaggedon blizzard 2010, the newly started Snowmaggedon Cleanup site— where citizens could post and get a situational overview about both acute problems and community resources on a google map—really took off when publicized by the Washington Post and WTOP news. 42 The concept has since spread to many other cities. Be open and forward-looking regarding emerging applications and platforms. While it may be tempting to tailor social media tools and strategies to whatever forms of social media are currently the most popular, it is important to take a more open and flexible approach. New forms of general and specialized social media emerge (and fade) regularly. 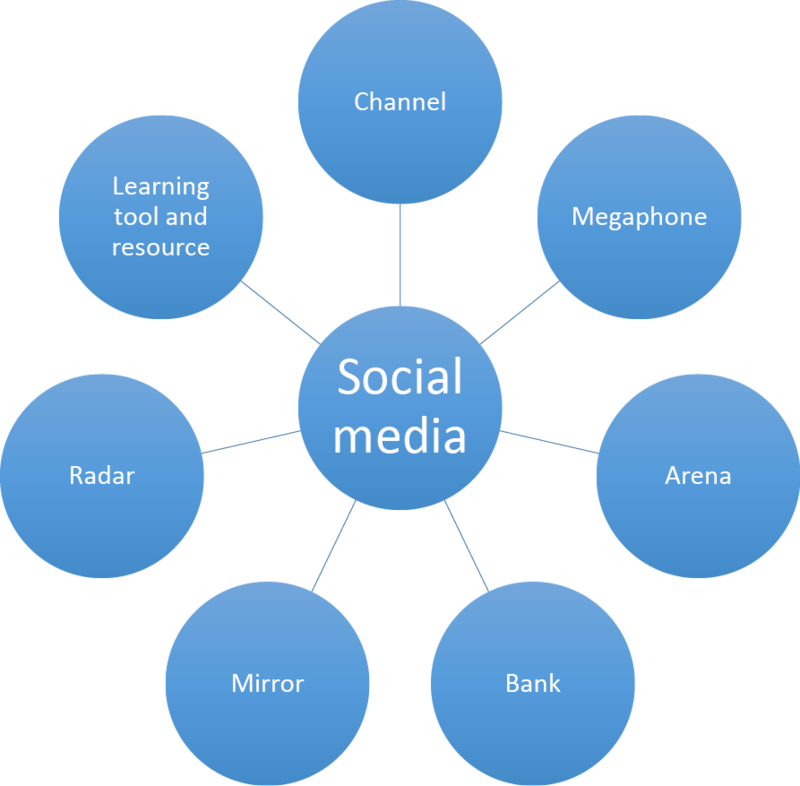 Social media components of crisis management strategies should be designed to be able to adapt to and make use of not only current social media platforms but also to incorporate others likely to emerge in the future. While initially it may make sense to emphasize the biggest ‘players’ (e.g. Facebook and twitter), mature social media strategies will match media formats and capabilities with more specific purposes and target groups. The realm of crisis management is often stranger than fiction and the ICT capabilities now commonplace in pockets, backpacks, and desktops often exceeds the capabilities of yesterday’s science fiction. Grasping the potential of and avoiding pitfalls associated with these developments remains a challenging task best undertaken in partnership and ongoing dialogue between the worlds of research and practice. Dr. Eric K. Stern is Professor of Political Science at the University at Albany, College of Emergency Preparedness, Homeland Security and Cyber-Security and the Swedish Defense University. He is the Editor-in- Chief of the Oxford Research Encyclopedia of Crisis Analysis, and a faculty affiliate of the Disaster Research Center at the University of Delaware. Stern has published extensively in the fields of crisis management, security studies, and leadership, as well as interactive education and exercise design. His longer works include The Politics of Crisis Management (Cambridge University Press, 2005/2017), The Changing Face of Strategic Crisis Management (OECD, 2015), Designing Crisis Management Exercises for Strategic Leaders (Swedish National Defense College, 2014), Auckland Unplugged (Lexington Books, 2003), and Beyond Groupthink (University of Michigan Press, 1997). He collaborates regularly with governments and international organizations on a wide variety of consulting and applied educational projects. He may be reached at ekstern@albany.edu. The author would like to acknowledge support for this research from the EU 7th Framework Program ATHENA project (Akghar et al., 2017), the Swedish Civil Contingencies Agency, the Swedish Defense University, and the University at Albany (SUNY) College of Emergency Preparedness, Cyber-Security and Homeland Security. Thanks also to Joe Brennan, Eva-Karin Olsson, Stephanie Young, Andy Vitek and the HSAJ reviewers & editorial team for helpful input and assistance. 1 L.Palen, “Online Social Media in Crisis Events,” Educause Quarterly, Issue 3 (2008), http://net.educause.edu/ir/library/pdf/eqm08313.pdf; S. Veil, T.Buehner, and M. Palenchar, “A Work in Process Literature Review: Incorporating Social Media in Risk and Crisis Communication,” Journal of Contingencies and Crisis Management 19, 2 (2011): 110-122. 2 A. Boin, et al., The Politics of Crisis Management: Public Leadership Under Pressure, (New York: Cambridge University Press, 2005); A Boin et al., , The Politics of Crisis Management: Public Leadership Under Pressure, 2nd edition, (New York: Cambridge University Press, 2016). 3 M. Gladwell, “Small Change: Why The Revolution Will Not Be Tweeted,” The New Yorker, October 4, 2010, http://www.newyorker.com/magazine/2010/10/04/small-change-malcolm-gladwell. 4 T. Drabak, The Human Side of Disaster, 2nd ed. (Boca Raton: CRC Press, 2013); S. Ada et al., “Factors Impacting the Intention to Use Emergency Notification Services in Campus Emergencies: An Empirical Investigation,” IEEE Transactions on Professional Communication 59, 2 (2016): 89-106. 5 The Politics of Crisis Management, 1st Ed . 6 The Politics of Crisis Management, 1st Ed and 2nd Ed. 7 See e.g. S. Veil, T. Buehner, and M. Palenchar, “A Work in Process Literature Review: Incorporating Social Media in Risk and Crisis Communication,” Journal of Contingencies and Crisis Management 19, 2 (2011): 110-122; C. Wendling, J. Radisch, and S. Jacobzone, “The Use of Social Media in Risk and Crisis Communication,” OECD Working Papers on Public Governance 24 (2013), Paris: OECD Publishing, http://dx.doi.org/10.1787/5k3v01fskp9s-en; E. K. Olsson, “Crisis Communication in Public Organizations: Dimensions of Crisis Communication Revisited,” Journal of Contingencies and Crisis Management (2014), doi: 10.1111/1468-5973.12047; and C. Wukich, “Social Media Use in Emergency Management, ” Journal of Emergency Management 13, 4 (2015): 281-294 for very useful overviews of the literatures on social media and crisis communication. 8 B. Akghar, D. Waddington and A. Staniforth, eds., Application of Social Media in Crisis Management – Advanced Sciences and Technologies for Security Applications, (New York: Springer, 2017). 10 E. Stern, “Crisis Management, Social Media, and Smart Devices,” In Application of Social Media in Crisis Management – Advanced Sciences and Technologies for Security Applications, edited by B. Akghar, D. Waddington and A. Staniforth, (New York: Springer, 2017). 11 The Politics of Crisis Management, 1st Ed ; The Politics of Crisis Management, 2nd Ed. 12 The Politics of Crisis Management , 2nd Ed. 13 K.E. Weick, “Enacted Sense-making in Crisis Situations, ” Journal of Management Studies 25, 4 (1988): 305-317; E. Stern, “Understanding and Identifying Strategic Crises Through Early Warning and Sense-making,” in The Changing Face of Strategic Crisis Management, Paris: OECD Publishing, 2015a, http://dx.doi.org/10.1787/9789264249127-en. 14 D.S. Alberts and E. Hayes, Power to the Edge, Washington, DC: Command and Control Research Program, 2003. 15 S. Veil, T. Buehner, and M. Palenchar, “A Work in Process Literature Review: Incorporating Social Media in Risk and Crisis Communication,” Journal of Contingencies and Crisis Management 19, 2 (2011): 110-122. 16 M. Mendoza, B. Poblete, and C. Castillo, “Twitter Under Crisis: Can We Trust What We RT?” in Proceedings of 1st Workshop on Social Media Analytics (SOMA 2010) July 25 (2010): 71- 79, Washington, D.C: IBM Research, http://snap.stanford.edu/soma2010/papers/soma2010_11.pdf; K. Starbird et al., “Rumors, False Flags, and Digital Vigilantes: Misinformation on Twitter after the 2013 Boston Marathon Bombing,” iConference 2014 Proceedings (2014): 654 – 662, doi:10.9776/14308; J. Surowiecki, The Wisdom of Crowds, (New York: Anchor, 2005). 17 The Politics of Crisis Management, 2nd Ed. 18 E. Stern,Crisis Decisionmaking: A Cognitive-Institutional Approach, (Stockholm: Department of Political Science, Stockholm University, 1999) ; Eric Stern et.al., “Post Mortem Crisis Analysis: Dissecting The London Bombings of July 2005, ” Journal of Organizational Effectiveness: People and Performance 1, 4 (2014): 402-422. 19 D. Kaufman, R. Back, and J. Riquelme, “Engaging the Whole Community in the United States” In Strategies for Supporting Community Resilience, edited by R. Bach, 151-186, CRISMART volume 41, Stockholm: Swedish Defense University, 2015. 20 The Politics of Crisis Management, 2nd Ed. 21 J.M. Sutton, “Social Media Monitoring and the Democratic National Convention: New Tasks and Emergent Processes,” Journal of Homeland Security and Emergency Management 6, 1 (2009); J. Sutton, L. Palen and I. Shklovski, “Back-Channels on the Front Lines: Emerging Use of Social Media in the 2007 Southern California Wildfires,” Proceedings of the 5th International ISCRAM Conference (2008), Washington DC; K. Stephens and A. Barrett, “Communicating Briefly: Technically,” International Journal of Business Communication 53, 4 (2016): 398-418. 22 The Politics of Crisis Management, 1st Ed ; S. Veil, T. Buehner, and M. Palenchar, “A Work in Process Literature Review: Incorporating Social Media in Risk and Crisis Communication,” Journal of Contingencies and Crisis Management 19, 2 (2011): 110-122; E.K. Olsson, “Crisis Communication in Public Organizations: Dimensions of Crisis Communication Revisited,” Journal of Contingencies and Crisis Management (2014), doi: 10.1111/1468-5973.12047. 23 K. Cavallo and D. Brienza, “Emotional Competence and Leadership Excellence at Johnson and Johnson, ” Europe’s Journal of Psychology 2, 1 (2006), Accessed December 6, 2016, http://ejop.psychopen.eu/article/view/313/html . 24 The Politics of Crisis Management, 2nd Ed; A. Boin, A. McConnell, and P. ‘t Hart, eds. Governing after Crisis, (New York, NY: Cambridge University Press. 2008). 25 The Politics of Crisis Management, 2nd Ed. 26 The Politics of Crisis Management, 1st Ed ; The Politics of Crisis Management, 2nd Ed; E. Deverell and E.K. Olsson, “Learning from Crisis: A Framework of Management, Learning and Implementation in Response to Crisis,” Journal of Homeland Security and Emergency Management 6, 1 (2009): Article 85; E. Stern, “Bridging the Crisis Learning Gap,” in Organizing After Crisis: The Challenge ofLearning, edited by Nathalie Schiffino et al. (Berlin: Peter Lang Publishing Group, 2015b). 27 This approach to exploring social media was inspired by Gareth Morgan’s (1986) classic study, Images of Organization. For a parallel analysis of the function of small groups in policymaking, see P.‘t Hart, E. Stern, and B. Sundelius, eds., Beyond Groupthink: Political Group Dynamics and Foreign Policymaking. (Ann Arbor: University of Michigan Press, 1997). 28 C. Wendling, J. Radisch, and S. Jacobzone, “The Use of Social Media in Risk and Crisis Communication,” OECD Working Papers on Public Governance 24 (2013), Paris: OECD Publishing, http://dx.doi.org/10.1787/5k3v01fskp9s-en; C. Wukich, “Social Media Use in Emergency Management,” Journal of Emergency Management 13, 4 (2015): 281-294. 29 D. Greco, E. Stern, and G. Marx, Review of ECDC’s Response to the Influenza Pandemic 2009/10, (Stockholm: European Center for Disease Prevention and Control, 2011), ECDC FEM wiki https://wiki.ecdc.europa.eu/fem/w/wiki/field-epidemiology. 30 E. Stern, “What The U.S. Can Learn from The Oslo Attacks,” Emergency Management, September 26 (2011), http://www.emergencymgmt.com/safety/US-Learn-Two-Pronged-Attack-in-Norway.html; M. Juergensmeyer, (2003) Terror in the Mind of God, (Oakland, CA: University of California Press, 2003). 32 M. Koraeus, and E. Stern, “Exploring the Crisis Management/ Knowledge Management Nexus,” In Strategic Intelligence Management, edited by B. Akghar and S. Yates, 134-149, (Oxford: Butterworth-Heinemann, Elsevier, 2013). 33 L. Seadon and R. Bach, “New Zealand: Renewing Communities and Local Governance,” In Strategies for Supporting Community Resilience, edited by R. Bach, 119-150, CRISMART volume 41, Stockholm: Swedish Defense University, 2015. 34 H. McHugh, “After Paris Attacks Parisians Use Hashtag to Offer Shelter, ” Wired, November 13, 2015, Accessed March 24, 2016, http://www.wired.com/2015/11/paris-attacks-parisians-use-porteouverte-hashtag-to-seek-offer-safe-shelter/ . 35 A.L. Hughes and A. Tapia, “Social Media in Crisis: When Professional Responders Meet Digital Volunteers,” Journal of Homeland Security and Emergency Management (2015), doi: 10.1515/jhsem-2014-0080; R. Bach, ed. Strategies for Supporting Community Resilience, Stockholm: CRISMART volume 41, Stockholm: Swedish Defense University, 2015. 36 B. Akghar and S. Yates, eds., Strategic Intelligence Management, (Oxford: Butterworth-Heinemann, Elsevier, 2013); J.M Sutton, “Social Media Monitoring and the Democratic National Convention: New Tasks and Emergent Processes,” Journal of Homeland Security and Emergency Management 6, 1 (2009); C. Wukich, “Social Media Use in Emergency Management,” Journal of Emergency Management 13, 4 (2015): 281-294. 37 H. Leonard et al., Why Was Boston Strong? Harvard University White Paper, Boston, MA: President and Fellows of Harvard College, Harvard University, 2014, Accessed June 1, 2014, https://www.hks.harvard.edu/content/download/67366/1242274/version/1/file/WhyWasBostonStrong.pdf; A. Tapia, and N. LaLone, “Crowdsourcing Investigations: Crowd Participation in Identifying the Bomb and Bomber from the Boston Marathon Bombing,” International Journal of Information Systems for Crisis Response and Management, (IJISCRAM) 6, 4 (2014). 38 Eric Stern et al. , “Post Mortem Crisis Analysis: Dissecting the London Bombings of July 2005,” Journal of Organizational Effectiveness: People and Performance, 1, 4 (2014): 402-422; E. Stern, “Bridging the Crisis Learning Gap,” In Organizing After Crisis: The Challenge of Learning, edited by Nathalie Schiffino et al. , (Berlin: Peter Lang Publishing Group, 2015b). 39 D. Greco, E. Stern, and G. Marx, Review of ECDC’s Response to the Influenza Pandemic 2009/10, Stockholm: European Center for Disease Prevention and Control, 2011, ECDC FEM wiki https://wiki.ecdc.europa.eu/fem/w/wiki/field-epidemiology. 40 Politics of Crisis Management, 1st Ed ; The Politics of Crisis Management, 2nd Ed. 41 L. Drennan,A. McConnell, and A. Stark, Risk and Crisis Management in the Public Sector, (London: Routledge, 2015). 43 Joe Brennan, University at Albany, personal communication.